Asking BJP Chief Ministers to work on "mission mode" for better implementation of central government schemes in their states, Prime Minister Narendra Modi on Saturday set up a party committee to prepare a road map of a uniform agenda for "welfare of poor". "The Prime Minister appealed us to work on 'mission mode'. The pace of work should not be slow. We have to move forward with a good pace and have to work on all fronts," Madhya Pradesh Chief Minister Shivraj Singh Chouhan quoted Modi as saying in his concluding remarks at the day long meeting of BJP Chief Ministers.Modi also warned the Chief Ministers that he won't allow negligence in implementation of schemes. "It was direction, or you can say, an appeal from the Prime Minister that no negligence will be allowed in implementation of schemes or even in governance," Chouhan said at a press conference after the meet.A committee was also formed, under Chouhan's chairmanship, to prepare a uniform road map for the welfare of poor. His Maharashtra and Jharkhand counterparts Devendra Fadnavis and Raghubar Das and party national vice-president Vinay Sahastrabuddhe are the members of the "Garib Kalyan Agenda Committee, which could focus on basic necessities of common man like 'Roti, Kapada aur Makaan, Padhai, Dawai aur Rozgar ke Intezam' (food, clothing, housing, education, medicine and employment opportunities). "A common agenda will be formulated and a road map will be prepaered by the committee in coming weeks so that basic necessities of poor would be fulfilled. This agenda will be implemented by all the BJP-ruled states," Chouhan said.The meeting was attended among others by nine Chief Ministers and three Deputy Chief Ministers, except Rajashthan Chief Minister Vasundhara Raje who was pre-occupied.Earlier, BJP President Amit Shah said that his party has ushered in an era of "politics of performance" in the country and asked the states to play a big role in the implementation of schemes and to bring in good governance.He also urged BJP Chief Ministers to replicate schemes which are running successfully in other BJP-ruled states. 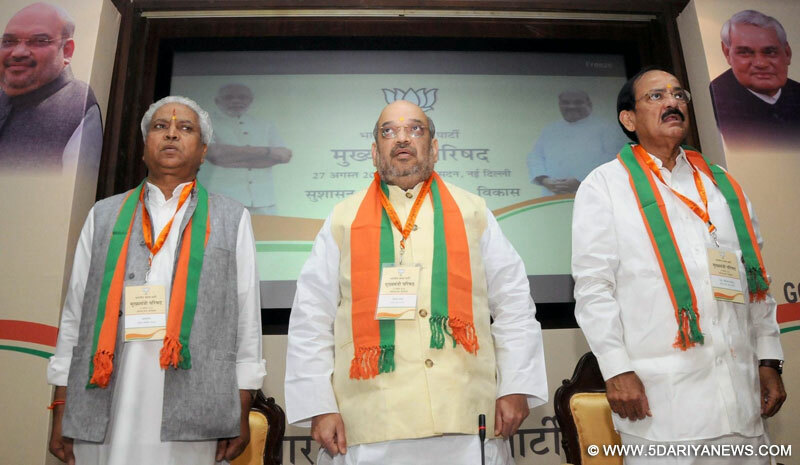 "The BJP has started an era of politics of performance in the country and our target is to give a decisive, transparent and corruption free government, besides providing welfare schemes to the downtrodden," Shah said in his inaugural address.Shah said it is the joint responsibility of the central and state governments to build a pro-poor welfare state and change the life of the common man, adding that states play an important role in the development of the country.Noting the BJP-ruled state governments are those which got re-elected time and again on the basis of performance, he also hailed the party-led NDA government saying it "has brought greater esteem to Indian culture and taken it to new heights. The way the world looks at India has changed".Later talking to reporters, Fadnavis said the meet was focused on the welfare of the poor, middle class, marginalised sections, farmers and labourers. "States play an important role in the development of the country. There are more than a thousand BJP MLAs all over the country, (and) more than 300 MPs," Fadnavis said at a press conference quoting Amit Shah.He said 37 per cent of India's population resides in BJP-ruled states, which also account for about 52 per cent of the country's geographical area and 41 per cent of its GDP. "If BJP ruled states can succeed in bringing change, a big part of the country will be developed. The states would play a key role in the success of the Modi government's welfare policies as they are responsible for executing 65 of the 80 such schemes launched by it," he said.Fadnavis said having rapid development and change in BJP-ruled states would contribute to good governance of the country.In the first session of the meet, the Chief Ministers gave presentations on the prominent schemes they are running in their respective states with regard to the party's vision of "Antyodaya".